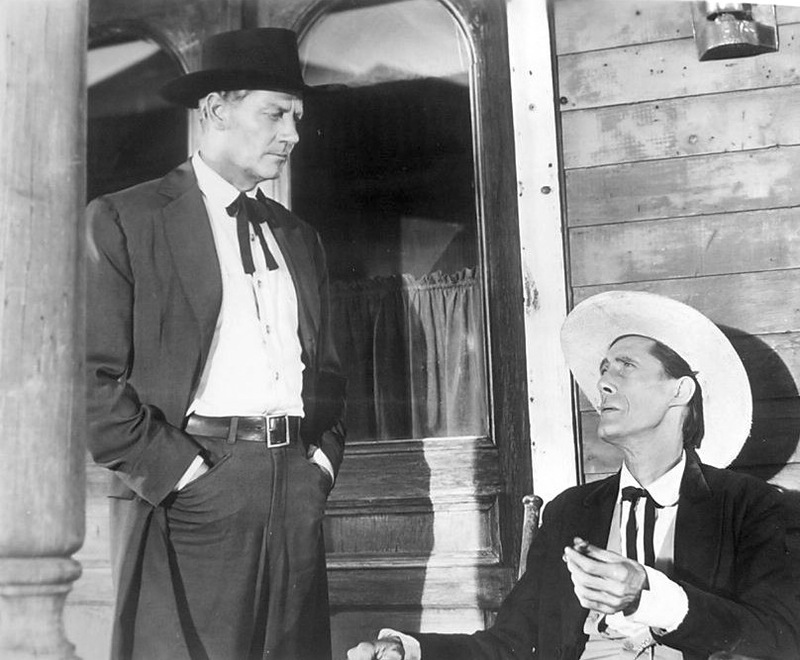 John Carradine | 50 Westerns From The 50s. 50s Westerns Blu-Ray News #265: The True Story Of Jesse James (1957). 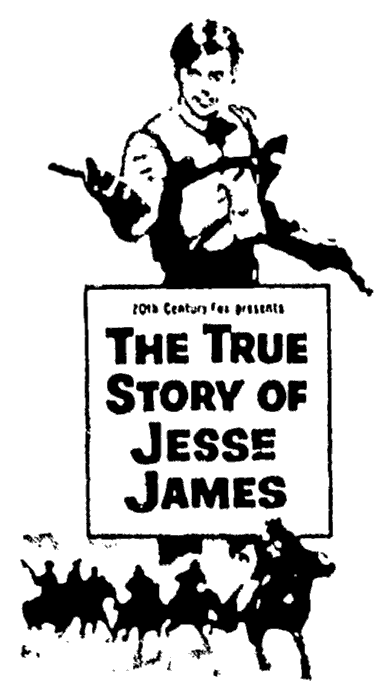 Nicholas Ray’s mangled masterpiece The True Story Of Jesse James (1957) is coming to Blu-Ray from Twilight Time. 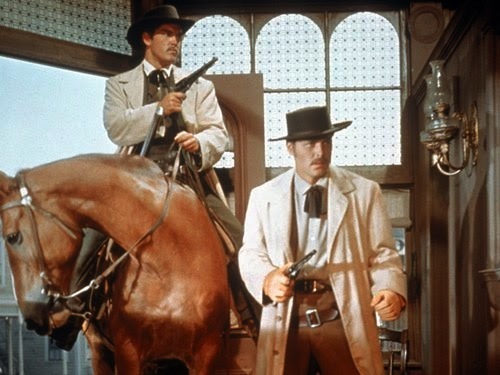 It’s one of my personal favorite 50s Westerns — for Ray’s incredible use of CinemaScope if nothing else, and it’s the subject of what I think is my best post ever for this blog. It’s coming November 20. Not sure what the extras will be, but I can’t wait. 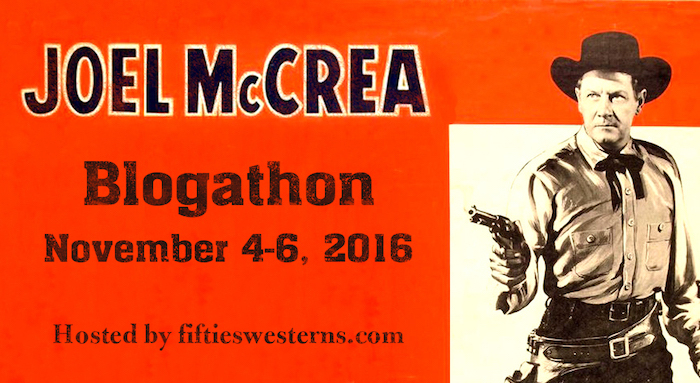 The Nicholas Ray Blogathon: The True Story Of The True Story Of Jesse James (1957). Produced by Howard B. Swope, Jr. CAST: Robert Wagner (Jesse James), Jeffrey Hunter (Frank James), Hope Lange (Zee James), Agnes Moorehead (Mrs. Samuel), Alan Hale (Cole Younger), Alan Baxter (Barney Remington), John Carradine (Rev. Jethro Bailey), Rachel Stephens (Anne James), Barney Phillips (Dr. Samuel), Biff Elliot (Jim Younger), Frank Overton (Major Rufus Cobb), Barry Atwater, Marian Seldes, Chubby Johnson, Frank Gorshin, Carl Thayler, John Doucette. 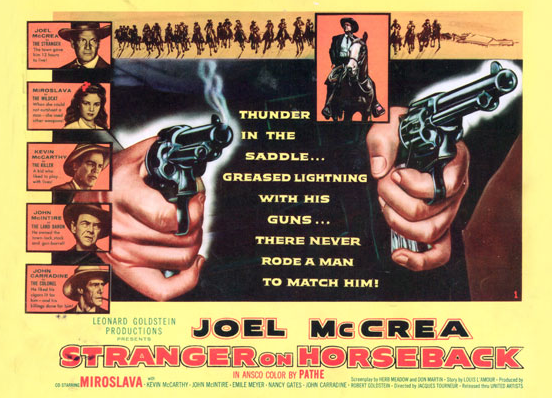 This is my contribution to the Nicholas Ray Blogathon, celebrating what would be Ray’s 100th birthday. Hosted by Cinema Viewfinder, you’ll find more posts here. There’s an infamous group of films that have achieved an almost mythic quality for a very odd reason — they were taken out of the director’s hands and re-thought, re-cut, re-shot or just generally monkeyed with by their studios, leaving us to wonder what could have been. The Magnificent Ambersons (1942). Pat Garrett And Billy The Kid (1973). Once Upon A Time In America (1984). The history of cinema is littered with such films. Home video has given many of these films a second chance, allowing them to be restored, reconstructed or re-re-cut to give us an idea of what should have been. Touch Of Evil (1958), for example. With others, such as Ambersons, the materials are lost, leaving us with not much more than anecdotes to attest to the fact that a true masterpiece was mauled. But other pictures have no Director’s Cut, no alternate ending, no defenders, no myth. We’re left with just another movie that doesn’t quite add up. 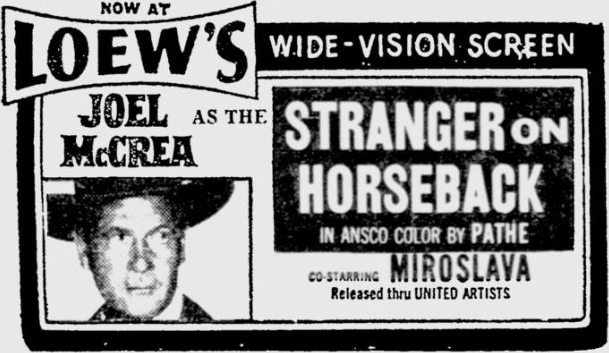 Sadly, that’s where Nicholas Ray’s The True Story Of Jesse James (1957) winds up. Nicholas Ray was on a bit of a roll heading into this picture. 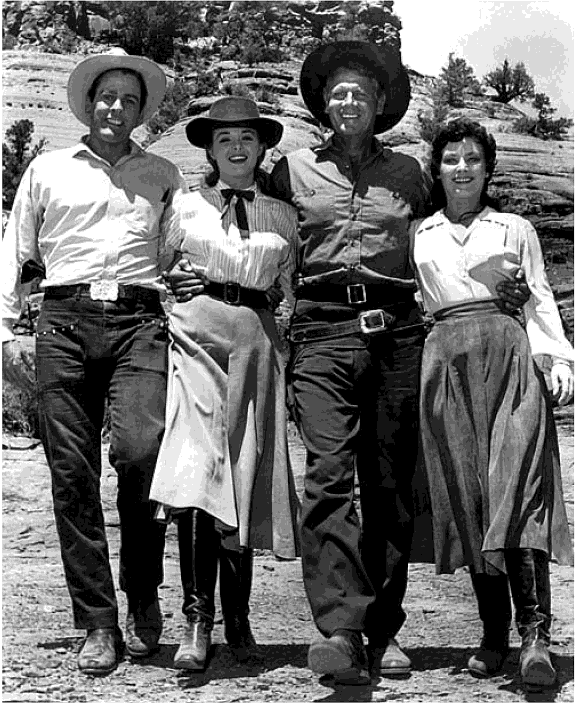 He’d directed two Westerns in recent years, the incredible Johnny Guitar (1954) and Run For Cover (1955). Rebel Without A Cause (1955) brought him together with James Dean — and would go on to become Ray’s biggest success and a truly iconic film. 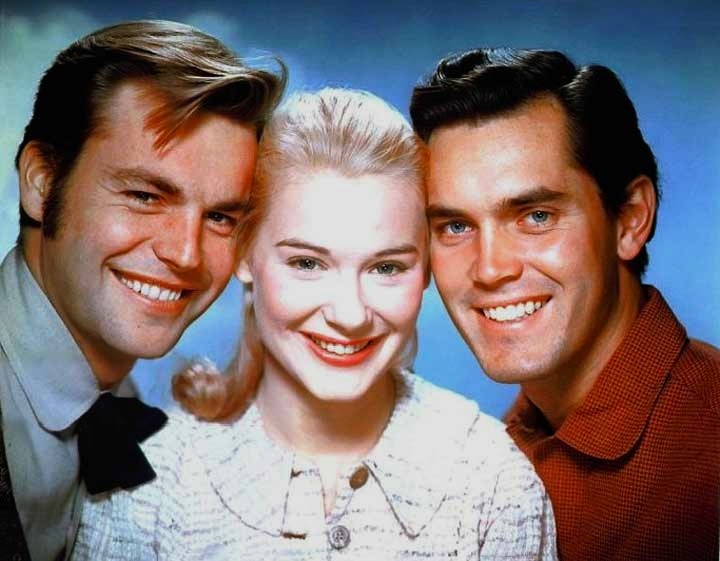 And Bigger Than Life (1956), though it wasn’t a hit upon release, is now seen as perhaps his masterpiece. As part of the deal that had included Bigger Than Life, Ray owed 20th Century-Fox another picture. 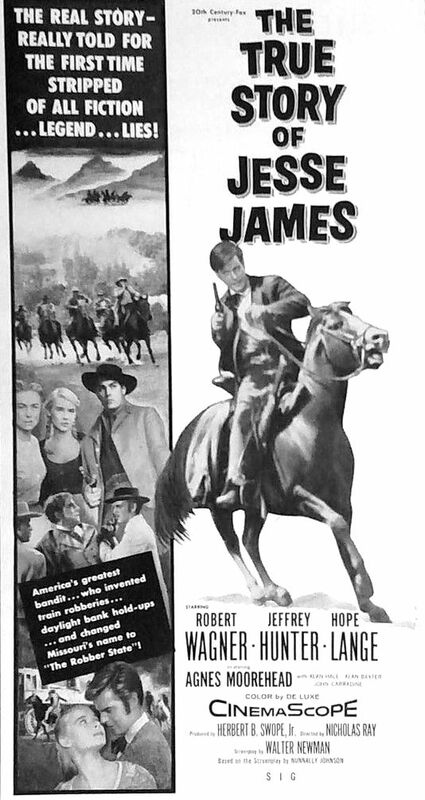 And the studio decided they wanted to remake Jesse James (1939), their big Technicolor hit from Henry King starring Tyrone Power and Henry Fonda as the James brothers. 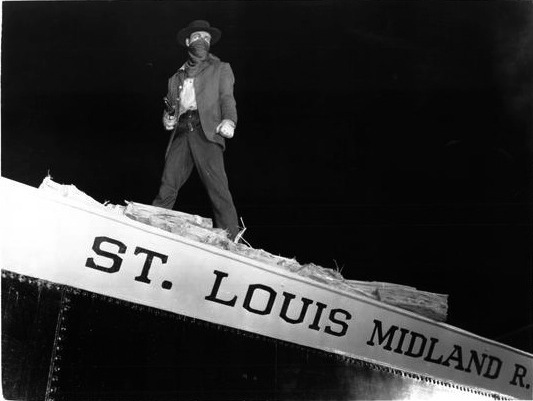 That version of the James gang story made enough to warrant a sequel, Fritz Lang’s The Return Of Frank James (1940), so why not return to the well? Every indication is that Ray, going in, was excited about the project and had big ideas. The studio’s ideas, however, turned out to be a bit smaller. This radical approach was turned down, if it was even pitched. Ray then became excited about actually shooting on location — Northfield, Minnesota, for example. The studio, however, wanted to shoot on rehabbed sets from other Fox pictures. What’s more, they had another recycling effort in mind — repurposing footage from the 1939 Jesse James. So far, Ray’s lost his location shooting and he’s saddled with stock footage from a film that his picture will certainly be compared to. And we haven’t gotten around to the script. In the beginning, 20th Century-Fox handed Nick Ray a script by Russell S. Hughes. He didn’t like it. So with Nunnally Johnson’s script for the 1939 picture as a springboard, Ray hired Walter Newman to work on a new screenplay. Newman had once worked with Ray on a picture about gypsies that never happened, and he’d recently written The Man With The Golden Arm (1955). They had more in mind than just working in a little psychology. Newman’s script, dated July 1956, was rejected by Fox — hard to read (those flashbacks), and Jesse wasn’t sympathetic enough. The next draft, by Ray and Gavin Lambert, and dated September 4, went over a bit better. Shooting began September 6, with the “final” script dated September 14. That script contains plenty of blue pages, indicating that changes continued during filming. Maybe somewhere in all those changes, it came to pass that The True Story Of Jesse James became not all that true — his granddaughter is credited with “historical data” — just truer than the Jesse James pictures that came before it. Then there was casting. Ray was convinced that Elvis Presley would make a good Jesse James. Elvis has just appeared in his first film, Love Me Tender (1956), for Fox, and was a dialogue-quoting fan of Rebel Without A Cause. But Hal Wallis had the King locked down tight at Paramount, and Fox was keen on using a young actor they had under contract, Robert Wagner. 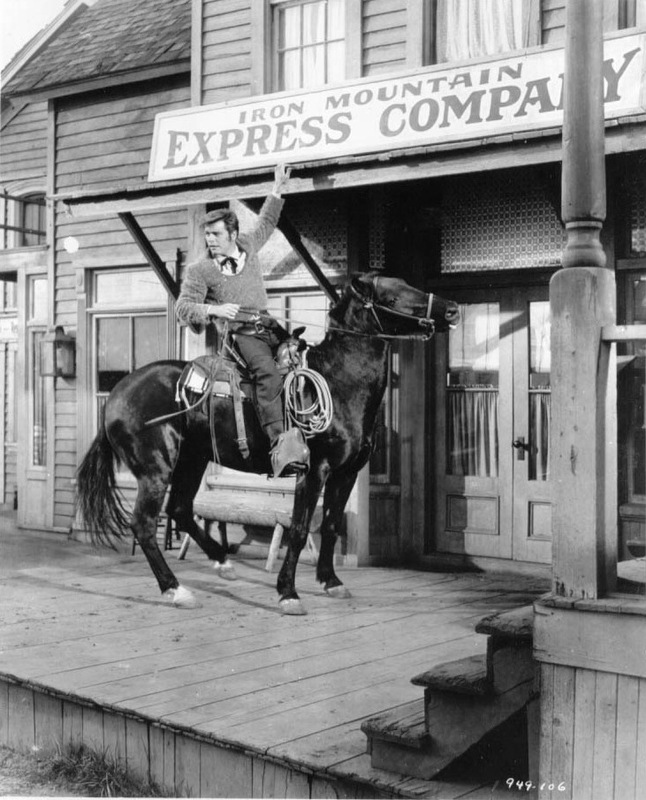 Joining Wagner was Jeffrey Hunter, who’s excellent as Frank James; Alan Hale as Cole Younger; Hope Lange as Zee, Jesse’s wife; Agnes Moorehead as Mrs. Samuel, the James boys’ mother; and Alan Baxter as the railroad man determined to bring the outlaws to justice. John Carradine, who played Bob Ford, Jesse’s murderer, in the 1939 film, is on hand here as the preacher who baptizes Jesse and Zee. And Nick Ray’s son, Tony, has a small part as Bob Younger. James Dean, dead. Elvis Presley, not available. Location shooting in Missouri and Minnesota, out. The flashback structure, compromised. As time went on, and as his vision of the picture began to fade, Ray began to think of the picture as a studio assignment, not a Nicholas Ray film. There wasn’t a lot to get excited about, and he turned to liquor and pills. Before photography began, Ray took a drunken fall at the Chateau Marmont, spraining the same ankle he’d injured during the shoot for The Lusty Men (1952). This gave him another reason to self-medicate. The picture begins with the botched Northfield robbery. 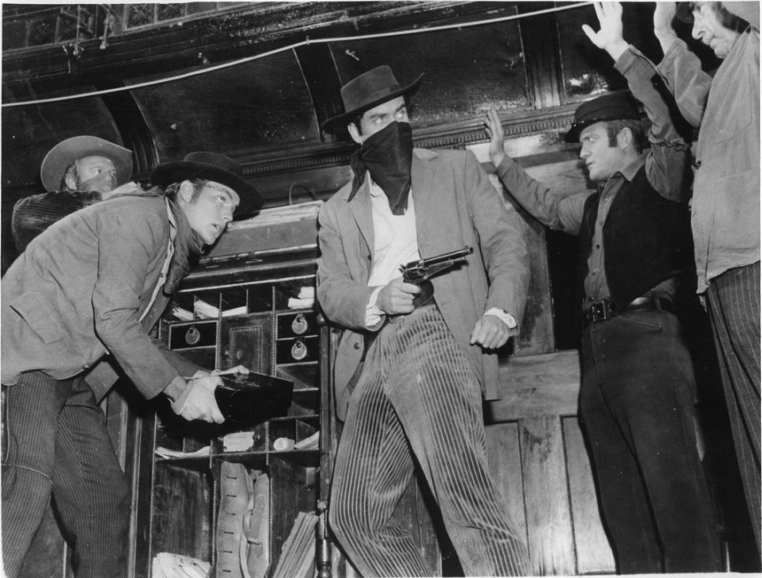 The James gang fleas with a posse lead by Sheriff Hillstrom (John Doucette) on their trail. 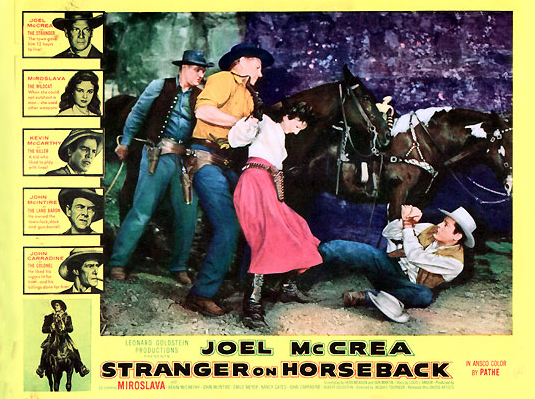 They escape by leaping off a cliff on horseback, thanks to the aforementioned footage from Jesse James. A newspaper man asks, “What makes him Jesse James?” — and the picture spends the rest of its running time trying to answer that question. 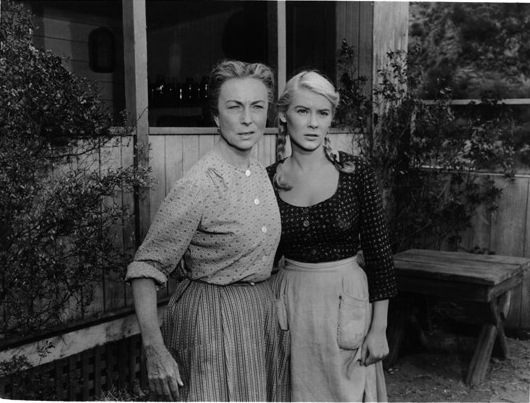 Much of the flashback structure is built around an ailing Agnes Moorehead telling us of her sons’ troubles. Naturally, she sees her boys as loving sons, while other characters recall things from a different point of view. 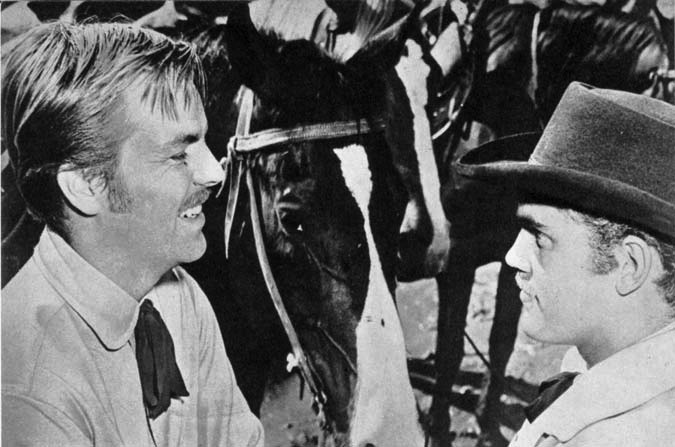 Starting in the days immediately after the Civil War, Frank (Jeffrey Hunter) and other Confederate veterans are being persecuted by Union sympathizers — making it hard for them to return to a simple life of farming. To feed their families and get back on their feet, Jesse suggests they return to the type of raids they excelled at during the war. Eventually, the picture takes us back to the Northfield job, and after learning of Jesse’s past, we see the robbery in a different light. We also see the change in Jesse. He’s no longer in it to fund a fresh start, but driven by his self-destructive nature, paranoia and a growing belief in his own myth. Of course, we all know where this leads, to his assassination by the Fords, guests in his own home. From fade-in to fade-out, The True Story Of Jesse James reeks of studio tampering. While the flashback structure works, the cloud-the-edges-of-the-frame device (which Ray didn’t want) is embarrassing. Swope, the producer, was sympathetic to Ray’s narrative style and persuaded the studio to test two versions — Ray’s and a more chronological approach. In the end, after a blowup in which Nick cussed out the Fox executives, the picture was re-cut, eliminating some of the flashbacks and narration. While Ray handled some of the re-shooting, in the end it was handed over to contract directors and a team of editors. Walking away from The True Story Of Jesse James, Nicholas Ray left for Europe where he’d soon make the brilliant Bitter Victory (1957). He claimed to have never seen the James film as released. So why do we bother watching a film when its director couldn’t be bothered to finish it? In other words, the whole can’t touch the sum of its parts. Ray’s unparalleled use of color and ‘Scope, along with some terrific sound design, make many sequences very effective — even if the picture as a whole falls short. Director of Photography Joe MacDonald had just shot Ray’s Bigger Than Life, another psychoanalytic study of self-destructive behavior — and one of the most incredible-looking CinemaScope films ever made. 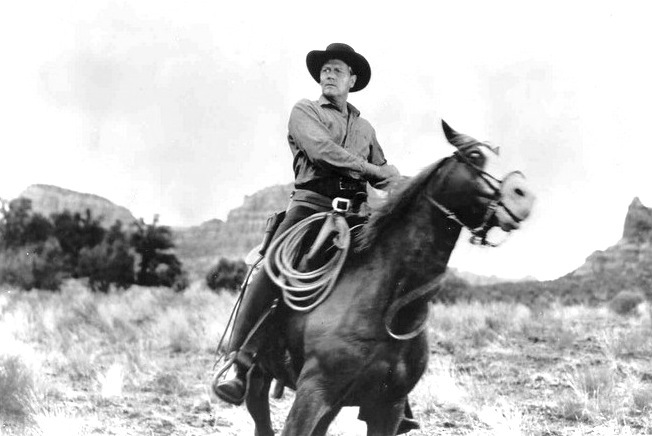 His credits also included John Ford’s My Darling Clementine (1946), a film of almost unreal beauty. There was no way The True Story Of Jesse James could be anything but stunning to look at. No one composes or blocks scenes even remotely like Nicholas Ray. The way characters come in and out of the wide frame is amazing to watch, with action in the foreground and background at the same time. 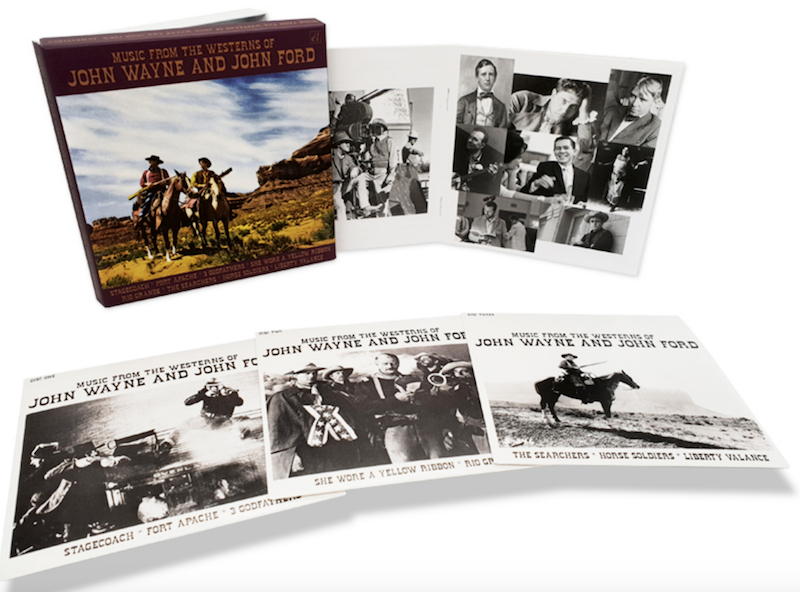 (The Northfield posse scenes are especially good.) Much is made of Ray’s training under Frank Lloyd Wright and how it might have impacted his films. Along with the widescreen photography and stereo sound design, the picture makes great use of music, though this aspect was also compromised. Leigh Harline, who wrote “When You Wish Upon A Star” for Pinocchio (1940), uses the traditional “The Ballad Of Jesse James” throughout, most effectively in the final scene, with a man singing it outside Jesse’s home after his murder — while inside, the gathering crowd steals souvenirs — the legend already in place. SOURCES: Nicholas Ray: An American Journey by Bernard Eisenschitz; Nicholas Ray: The Glorious Failure Of An American Director by Patrick Macgilligan; Pieces Of My Heart: A Life by Robert Wagner with Scott Eyman.